As I watch the second installment of the JJ Abrams Star Trek series it reminds me why I more strongly associate with the Trekkie sphere of influence than the Star Wars fandom. The film making of the Star Trek realm has historically fallen short of the high mark trail blazed by the Star Wars movies. They utilized inferior (bordering on campy) special effects, and overall visuals and production value that seemed less devoted to pushing the genre. Lucas pushed all the boundaries in film making distancing his franchise well out of the grasp of all other lower budget sci-fis. And in his series he spun a marvellous epic story of good versus evil. Where he fell short was in directing his cast and handcuffing them with weak unnatural dialogue. Star Wars was marketed to adults and children, while Star Trek never professed to include anything within its storyline or intellectual content that would appeal to children. Star Trek plots, operated within the confines of a prime directive and their characters were not solely driven by revenge and justice. Their exploration of the universe fed the story line and provided its audience with a plethora of adventures and complex conflicts to overcome. Each struggle encountered required diplomacy and reason to resolve the dilemma. Like the Rebel forces of Star Wars the Enterprise found themselves in unfavourable odds and saddled with inferior weaponry. In Star Wars however, no one seemed to outwit their enemies and instead relied on bravery and lets not forger the game changing magic of the mystic Force. What separated the franchises in that era was the technology available and pioneered in the Lucas arsenal of film making. Not anymore. Now the playing field is level. Star Trek has its own visionary director and controller in JJ Abrams. JJ has similar film making tools at his disposal and all of the years of master sci-fi directors, which he borrows from regularly. JJ has something else going for him. He can also direct actors. He assembles an awesome supporting staff of talented writers that afford the actors with smooth intelligent dialogue that will stand up years from now unlike the campy Star Wars talk. As for the technology, Star Wars' science is utter nonsense whereas it can be argued that Star Trek's has driven the possible science of today and tomorrow. Star Wars' future is not unlike our own in that the characters face similar struggles of war, intolerance and politically driven class inequalities. While Star Trek offers a more Utopian model of the future, and the characters reaction to any threats to that standard or any other races' for that matter often builds into much of their plot lines. I'll let you decide which of these two attributes is better. Personally I tend to long for what I don't have. Where I believe that Star Trek enjoys its biggest competitive edge is with its characters. I believe that Star Trek offers a much richer cast of interesting characters. They range from the dynamic bravado of Kirk to the comedic touch of Bones and Scotty and penultimately the incompatible duality of logic and humanity struggles offered by Spock. I would further venture that Spock is one of the all time best developed character in cinematic history. SWs offers a few characters with sporadic charm but for the most part a large contingent of them a childish, pathetic or ultimately dull. Now I get my umbrella to shield myself from the angry SW fans' protest. However, before you start depositing horse heads in my bed let me remind you that I too am a big SW fan. With that said though you have to admit that the most interesting characters in Star Wars are the villains and unfortunately there isn't enough of them and the screen time is limited. 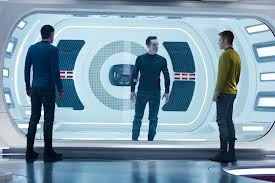 With all that said I should return to the matter at hand, Star Trek Into Darkness. This is a top notch film. It leaves nothing to its predecessor and will stands well on it own. The story is compelling and in interesting. The casting is out of this universe. All the returning staff of the Enterprise hit their mark and the story offers further character development which paints them as real flawed and complex people. The most refreshing addition was the villain played by Benedict Cumberbatch. His portrayal is fierce and convincing. He reinvents the Khan character and breathes new interesting intricacies into the personality. Cumberbatch is a force and we will see much of him as America adopts him. Action, visuals, acting, story and overall coolness. See it. 99 songs to make your homework awesome.